DeAngelo Hall is calling it a career. The Redskins defensive back says he’s “done” playing football (Twitter link via John Keim of ESPN.com). Hall has yet to make it official, but the 34-year-old is considering offers to join a front office or work in television. The Falcons brought Hall into the league as the No. 8 overall pick in the 2004 draft and he went on to earn two Pro Bowl nods in Atlanta. Prior to the 2008 season, he was shipped to the Raiders and signed a seven-year deal worth up to $70MM with the club. That deal was terminated after just eight games, leading him to the Redskins. Over the last ten seasons, Hall has appeared in 106 regular season games for the Redskins with 97 starts. In recent years, however, he has been limited by injuries. Hall has played in just eight games over the last two seasons and hasn’t turned in a full season since 2013, so this is probably the right time for him to hang ’em up. Hall leaves the game with three Pro Bowl selections (2005, 2006, 2010) as well as a place in the record books. In 2010, Hall picked off Bears quarterback Jay Cutler four times, including a 92-yard pick six, which ties him for the single game record along with 13 other players in league history. Only two players – Hall and Deltha O’Neal – have hit that watermark since 2001. Washington looks to be getting some reinforcements to their secondary in the form of a 33 year-old defensive back. The Redskins have activated safety DeAngelo Hall from the PUP after the veteran returned to practice in Week 7, according to a team announcement. Washington has waived offensive lineman Orlando Franklin to make room on the active roster. Hall was placed on the PUP back in training camp as he recovered from a torn ACL he suffered last season against the Giants. The 14-year veteran brings another capable asset into a defensive backfield that consists of Josh Norman, Quinton Dunbar, D.J. Swearinger and Montae Nicholson. It remains to be seen how much playing time Hall will get in the early goings, but it will certainly be a welcomed addition coming on the heels of two crushing defeats by division foes Philadelphia and Dallas. Hall is not the player he once was when he came into the league with the Atlanta Falcons in 2004, having played his last full season in 2013 when he had four picks on the year. The safety has not registered an interception since that time. Franklin, 29, signed with the team last week, but was vulnerable after the Redskins offensive line got healthier. The former second round pick spent his first four years in the NFL with the Broncos before moving onto the Chargers for the last two seasons. The guard was cut by Los Angeles at the beginning of this year and will once again be an option for teams looking to build up their offensive line depth in the second half of the year. The Redskins have restructured DeAngelo Hall‘s salary for the second time since June, according to Mike Jones of the Washington Post. Instead of the $2.2MM Hall was scheduled to make, the safety will earn a fully guaranteed $1.1MM and have a chance at some incentives. Prior to June, Hall was set to earn a base salary of $4.25MM with a cap number above $5MM. However, given his recent injury troubles, the Redskins don’t believe he’s worth that type of money anymore. The 33-year-old Hall appeared in just 17 of a possible 48 regular-season games over the past three campaigns. Thanks to the torn ACL he suffered last year, he’ll begin this season on the PUP list and miss the first six weeks. 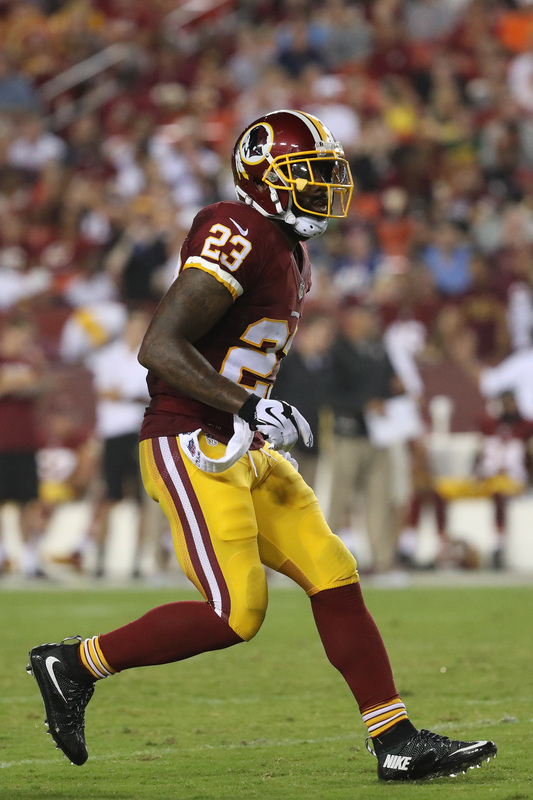 The Redskins will start the year without the services of DeAngelo Hall. The safety says he’ll be on the PUP list to begin the season. “Dr. [James] Andrews doesn’t think I’m quite ready. I’m gonna take his advice,” Hall told JP Finlay of CSNWashington.com (Twitter link). Hall, 33, suffered a torn ACL in Week 3 of the 2016 season and is still working to get back to full strength. After taking a pay cut in June, his spot on the roster is likely still secure. The veteran will be taking in a $2.3MM base salary rather than the $4.25MM non-guaranteed base salary he was originally slated to receive. Hall appeared in just 17 of 48 possible regular season games over the past three seasons. The Redskins expect that he’ll be ready to go when eligible to come off of the PUP list this fall, but if not, they do have some safety nets in place. The versatile Su’a Cravens is expected to play at safety more than at linebacker and the team also added free agent D.J. Swearinger as a free agent. Fourth round pick Montae Nicholson will also be competing for time and could see significant reps if he is not too raw. There’s still no movement toward a deal between the Rams and cornerback Trumaine Johnson, per ESPN.com’s Alden Gonzalez, who’s the latest to report that he’ll play 2017 under the franchise tag. Yahoo Sports’ Charles Robinson relayed earlier this week that no agreement would come to fruition by Monday’s deadline, meaning Johnson will play the season as the NFL’s highest-paid corner. Johnson will earn $16.742MM in his second straight year as the Rams’ franchise player, and the likelihood is that he’ll test the free agent market next offseason. Tagging him again isn’t going to happen because doing so would cost the Rams $24.1MM. The NFL needs to make a decision on whether to suspend Cowboys running back Ezekiel Elliott as soon as possible, opines Mike Florio of Pro Football Talk. In doing so, he league would ensure that the internal appeals process would be resolved by Week 1, reasons Florio. Elliott is bracing for a season-opening ban, according to Adam Schefter of ESPN, and Florio wonders if the league leaked that information to Schefter in order to gauge the opinions of both the public and Jerry Jones. The Cowboys owner has made it known to NFL higher-ups that he won’t react kindly if the league suspends one of his stars without ample justification, reports Florio. Given the power Jones has, the NFL “needs to placate” him, writes Florio; at the same time, the league’s also in a difficult situation because it can’t afford to screw up another ruling involving domestic violence. The Eagles want to “take a little bit off” second-year quarterback Carson Wentz‘s plate this season, head coach Doug Pederson told Comcast SportsNet’s John Clark this week (via Reuben Frank of CSNPhilly.com). Pederson believes that the offseason additions of wide receivers Alshon Jeffery and Torrey Smith and running back LeGarrette Blount should make life easier for Wentz, who didn’t have enough help at the skill positions last season and attempted 607 passes – the second-highest rookie total in NFL history, notes Frank. “Everything doesn’t have to fall on Carson’s shoulders and I think sometimes a little bit last year he felt that way and things had to fall his way a little bit to make a play and I don’t think we have to do that this year,” said Pederson. Redskins safety DeAngelo Hall agreed to a pay cut last month, but he’ll still enter training camp in danger of losing his roster spot, suggests Rich Tandler of CSN Mid-Atlantic. A couple of other veteran safeties, Will Blackmon and Josh Evans, are also on the bubble, per Tandler. Injuries limited Hall to just 17 games over the previous three seasons, including a mere three in 2016. Conversely, staying healthy hasn’t been a problem for the 32-year-old Blackmon, who has made 30 of 32 appearances and logged 16 starts since joining the Redskins prior to 2015. Evans, a regular for the Jaguars from 2013-15, was on and off Washington’s roster last year and only played two games. Redskins safety DeAngelo Hall told reporters today that he is accepting a pay cut for the 2017 season. The move was pretty much expected in order for Hall to remain with the team. Initially, Hall was set to earn a base salary of $4.25MM with a cap number above $5MM. Now, Hall will bring in a $2.3MM base salary, according to Mike Jones of the Washington Post (Twitter link), who adds Hall can earn back another $250K if he earns a Pro Bowl nod. Hall appeared in just 17 of 48 possible regular season games over the past three seasons. Thanks to the torn ACL he suffered last year, it’s possible that he could begin the 2017 season on the physically unable to perform list. All things considered, the 33-year-old didn’t have a ton of leverage on his side when the Redskins pushed for a hair cut. If Hall is unable to stay healthy this year, they do have safety nets in place. Utility man Su’a Cravens is expected to play at safety more than at linebacker and the team also added free agent D.J. Swearinger as a free agent. Fourth round pick Montae Nicholson will also be competing for time and could see significant reps if he is not overly green. Our friends at Roster Resource have Swearinger and Cravens as the projected starting safeties. The Eagles reportedly have interest in a reunion with free agent wide receiver Jeremy Maclin, but their lack of cap space (around $5MM) is likely to stand in the way, writes David Murphy of Philly.com. Plus, with other proven pass-catching options in Alshon Jeffery, Torrey Smith, Jordan Matthews and Zach Ertz, the Eagles don’t need Maclin as much as other teams that are chasing him. Therefore, Philadelphia won’t have the motivation to get into a bidding war for Maclin and use what little spending room it has left on him, reasons Murphy. The Saints had interest in pass rusher Elvis Dumervil before he signed with the 49ers on Monday, reports Nick Underhill of the Advocate (on Twitter). It took the 33-year-old Dumervil nearly three months to find a new home after the Ravens released him in March, but San Francisco was the only team to bring him in for a workout. Dumervil potentially could’ve helped a New Orleans club whose defense finished just 27th in sacks last season. A pay cut for Redskins safety DeAngelo Hall is seemingly inevitable, suggests Rich Tandler of CSNMidAtlantic.com. The Redskins would like to knock $2MM to $3MM off the 33-year-old’s salary, per Tandler. Hall’s currently set to make $4.25MM, which is high for someone who has appeared in just 17 of 48 regular-season games dating back to 2014 and could begin 2017 on the physically unable to perform list. Although Rams pass rusher Connor Barwin‘s took a one-year deal earlier in the offseason, his goal is to play through the 2020 campaign. “Yeah, I think I want to play 12 years,” he told Alden Gonzalez of ESPN.com. “This will be nine, so I think I have four more. I’d like to do three stints of four – Houston, Philly and L.A.” Barwin played under new Rams defensive coordinator Wade Phillips with the Texans from 2011-12, and the 30-year-old expects their reunion to prolong his career. “I loved playing for Wade [while with the Texans in 2011-12], just in general,” said Barwin. “But I think playing in this system will be good for me to keep playing for a couple more years, because it takes advantage of what I do well. It allows me to still play every single snap. Play first down, second down, rush the passer on third down, but be able to cover guys when I need to — tight ends, running backs, that sort of thing. Veteran Redskins safety DeAngelo Hall may begin the season on the physically unable to perform list, head coach Jay Gruden told reporters, including John Keim of ESPN.com. Hall, 33, appeared in only three games last season before suffering a torn ACL. Scheduled to earn $4.25MM in non-guaranteed base salary in 2017, Hall could conceivably be viewed as a candidate for release. But Washington has no plans to cut Hall at the moment, per Keim, as the club wants to give him a shot at recovery before deciding to part ways. If Hall does have to miss time at the start of the 2017 campaign, the Redskins should be well-prepared to account for his absence. Washington signed D.J. Swearinger to a three-year, $13.5MM contract in March, and plans to use 2016 second-round pick Su’a Cravens at safety full-time. Other safeties on the Redskins’ roster include Will Blackmon, Montae Nicholson, Deshazor Everett, and Josh Harvey-Clemons. North Carolina State safety Josh Jones visited the Ravens on Thursday, reports Ian Rapoport of NFL.com (Twitter link). Jones ranks 48th on the board of Daniel Jeremiah of NFL.com, so he could be a candidate for Baltimore’s second-round pick (No. 47). “Most signs point to” the Redskins retaining safety DeAngelo Hall on a reworked contract, writes JP Finlay of CSN Mid-Atlantic. The 33-year-old is slated to take up over $5MM in cap space next season, though the Redskins would save most of that ($4.25MM) by releasing him. Hall hasn’t stayed healthy in recent years, having missed 31 of 48 regular-season games since 2014, so he wouldn’t have much leverage if the Redskins were to insist on a pay cut.